A Finalist for the Nebula Award for Best Novel and the 2019 Lammy Award for best LGBTQ SF/F/Horror**! ** One of the best books of 2018, according to NPR, Publishers Weekly, BuzzFeed, the Chicago Review, BookPage, and the B&N Sci-Fi and Fantasy Blog. 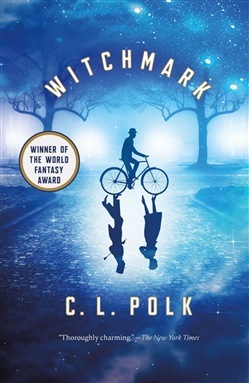 C. L. Polk arrives on the scene with Witchmark, a stunning, addictive fantasy that combines intrigue, magic, betrayal, and romance. The New York Times calls it “thoroughly charming and deftly paced... an accomplished and enjoyable debut.” In an original world reminiscent of Edwardian England in the shadow of a World War, cabals of noble families use their unique magical gifts to control the fates of nations, while one young man seeks only to live a life of his own. Magic marked Miles Singer for suffering the day he was born, doomed either to be enslaved to his family's interest or to be committed to a witches' asylum. He went to war to escape his destiny and came home a different man, but he couldn’t leave his past behind. The war between Aeland and Laneer leaves men changed, strangers to their friends and family, but even after faking his own death and reinventing himself as a doctor at a cash-strapped veterans' hospital, Miles can’t hide what he truly is. When a fatally poisoned patient exposes Miles’ healing gift and his witchmark, he must put his anonymity and freedom at risk to investigate his patient’s murder. To find the truth he’ll need to rely on the family he despises, and on the kindness of the most gorgeous man he’s ever seen. At the Publisher's request, this title is being sold without Digital Rights Management Software (DRM) applied. Acquista Witchmark in Epub: dopo aver letto l’ebook Witchmark di C. L. Polk ti invitiamo a lasciarci una Recensione qui sotto: sarà utile agli utenti che non abbiano ancora letto questo libro e che vogliano avere delle opinioni altrui. L’opinione su di un libro è molto soggettiva e per questo leggere eventuali recensioni negative non ci dovrà frenare dall’acquisto, anzi dovrà spingerci ad acquistare il libro in fretta per poter dire la nostra ed eventualmente smentire quanto commentato da altri, contribuendo ad arricchire più possibile i commenti e dare sempre più spunti di confronto al pubblico online.